Published on March 2, 2011 in Culture, General T&T, People's Partnership, Politics and Race and Identity. 15 Comments Tags: Multiculturalism, Selwyn R. Cudjoe. Any society that aspires to be a cohesive national entity must be willing to accept all of its history; not just parts of it. And herein lies a problem that no multiculturalism in Trindiad and Tobago can fix: that is, a proper estimation and acceptance of Dr. Eric Williams’ role in our national development. It is precisely the inability of most of our Indian population to accept the totality of our history and the heterogeneous nature of our origins that prevent them from acknowledging Dr. Williams’ status as the father of our nation. Published on February 16, 2011 in Culture, General T&T, People's Partnership, Politics and Race and Identity. 20 Comments Tags: Multiculturalism, Selwyn R. Cudjoe. Published on February 9, 2011 in Culture, General T&T, People's Partnership and Politics. 24 Comments Tags: Multiculturalism, Selwyn R. Cudjoe. It was an amazing thing. One week after I offered my reservations about the Government’s multiculturalism initiative, David Cameron, Prime Minister of Britain, made a scathing attack against his country’s approach to what he called “state multiculturalism” at the Munich Security Conference. In doing so, he echoed Angela Merkel, the German Chancellor who, in October 2010, called for “the end of multiculturalism” in her country. Published on January 17, 2011 in Culture, General T&T, Politics and Race and Identity. 19 Comments Tags: Kamla Persad-Bissessar, Multiculturalism, Politics, Selwyn R. Cudjoe, T&T Govt. A few days after Kamla Persad Bissessar became the Prime Minister of Trinidad and Tobago she dropped in at the headquarters of the Maha Sabha and announced blithely that the nation will adopt a multicultural rather than a transcendent cultural policy that served our nation well during its first fifty years of its existence. Such an announcement constituted a repudiation or reversal of Dr. Eric Williams’s vision that was contained in his “Mother Trinidad and Tobago Speech” that emphasized our commonalities rather than our differences. Dr. Williams envisioned a nation in which we should consider ourselves Trinidadians and Tobagonians first, anything after that. Published on December 10, 2010 in Africa, Culture, Elections, General T&T, India, People's Partnership, PNM, Race and Identity and UNC. 29 Comments Tags: Kamla Persad-Bissessar, Multiculturalism, Politics, Sanatan Dharma Maha Sabha, Sat Maharaj, Satnarayan Maharaj, Selwyn R. Cudjoe, T&T Govt. When my friend Prof Selwyn Cudjoe invited me to deliver the feature address at the launch of his latest publication, Indian Time Ah Come In Trinidad and Tobago, my first response was that this was a set-up. Was Selwyn attempting to portray Sat Maharaj and Indians in general as a group glorifying in the political success of the People’s Partnership in a boastful way? 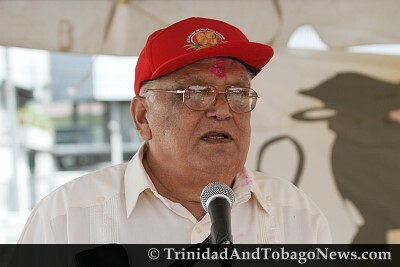 Published on June 3, 2010 in Culture, Entertainment, General T&T, India, People's Partnership, PNM, Politics and UNC. 8 Comments Tags: Indian Arrival Day, Kamla Persad-Bissessar, Multiculturalism, Phagwa, Sanatan Dharma Maha Sabha, Sat Maharaj, Satnarayan Maharaj. For a number of years the Sanatan Dharma Maha Sabha has been advocating that the Ministry of Culture be renamed the Ministry of Multiculturalism with all the attendant policy changes. On May 28, at the SDMS Indian Arrival Day dinner at the Centre of Excellence, Prime Minister Kamla Persad-Bissessar announced that she heard the Maha Sabha’s call and that the Ministry of Arts and Culture would be renamed the Ministry of Arts and Multiculturalism. We have always advocated the culture of a country in the spontaneous expressions of the people and that the State has no business in culture except as a facilitator. The State must not decide which of the various cultures of our land should receive enhanced funding and which shouldn’t. Political affiliation and support must not be the measure of state support.